Throughout my travels, I've met many social entrepreneurs and innovators who are making the world a better place. In this interview series, you will hear from incredible leaders who are changing the way we do good in the world. Alexandre: What is a great story you can share about one of your beneficiaries? Suryakant joined the Magic Bus programme when he was just 10. He's from Asia's largest slum, Dharavi, where people live in dire circumstances. His father is a cobbler, and his mother is a home-maker -- five of them were living on just $48 per month in a cramped 7x10 square foot one room home. He was set to follow in his Father's footsteps, working for daily wages struggling to survive. 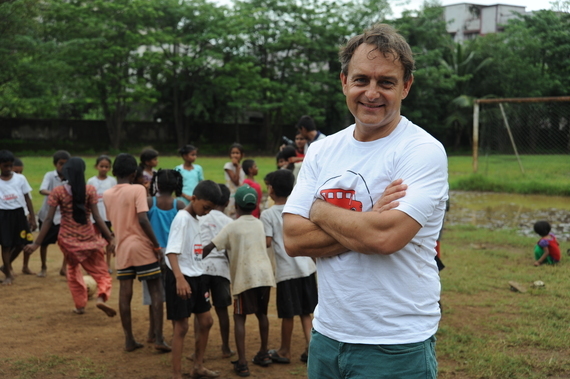 But he stayed with us for 10 years being mentored by a Magic Bus youth leader called Sheetal from his same community. Suryakant knows how to balance all his responsibilities including study and work, and being a Magic Bus community youth leader. He can get through job interviews, and he speaks English fluently -- skills he learned on our Livelihood program. Having these abilities helped him to gain the confidence to get the job he's in now. Today at 20, he's studying for a degree at University and working as a Business Development Manager for an events company. He wants to become a businessman and take his parents on a world trip! Every Saturday Suryakant also mentors children and youth in the Magic Bus program. He often tells me that if it wasn't for his mentor Sheetal, he wouldn't be where he is today. He wants to do the same for children in his community. In many ways, Suryakant's story epitomises how the program works and why it's sustainable in the long run. The key point in his story, for instance, is the fact that it is he and his community; the youth leaders, children and parents, that take ownership of solving the problems they face. We provide young people with the right skills, and open up opportunities for them through various private and public sector partners. Ultimately, by the time our children develop into adults, they are ready to be in higher education, vocational training or full-time employment. Alexandre: What was a life changing moment for you? When I realised that we could use people from the same community as role models for our children. It happened when I was teaching rugby to the boys that used to hang out on the streets outside the Bombay Gymkhana. I noticed how, with such ease, they took on the role of being a coach and mentor to children and other young people from their own community. That's how the role model approach was born for Magic Bus and I believe that is why the program continues to be so powerful. Alexandre: When you were 15, what did you want to do? At 15, I didn't know what I wanted to do, but when I was 17 I decided I wanted to come to India to work with children and run an orphanage. So my adventure began at 18 in Dharamsala where I found myself teaching English to young Tibetan monks at a Monastery that was six hours away in the mountains! I then headed for Kolkata to volunteer with Mother Theresa's 'Sisters of Charity' where I worked with tuberculosis and leprosy patients. You could say it was my first real comprehension of India's awkward divide between the poor and rich, and an early apprenticeship in the work we're doing today at Magic Bus. Alexandre: How do you want people to remember you? I want people to remember Magic Bus, and not me. It's always been about moving people out of poverty for me, and I want that legacy to continue having an impact. The power of that becomes faceless as an individual. Alexandre: The three most important things for you to run successfully your organization? Having the right culture, having the right people for the right jobs, and innovation. Collaboration, execution of a good strategy on a good idea, and continual innovation around that idea is vital, and then having the right people to deliver that idea and strategy.